Take a detailed look at the different parts of a domain name, using this site as an example. 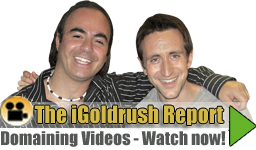 This site’s domain name is igoldrush.com – you can check this easily by looking at the URL or location bar of your browser. There you should see the entire URL, which should look like this: https://www.igoldrush.com/ . The “igoldrush.com” portion is the actual domain name. Anything listed after that is used to identify specific content within that site. Much like the organizational system of a filing cabinet, website content is arranged in a hierarchical system. For example, if you wanted to direct someone to a specific document in room full of filing cabinets, you would direct them to a specific filing cabinet, a folder within that cabinet, and finally the desired paper. So your directions could look something like this: English Cabinet 1/2007 Folder/Page 2. In this analogy, “English” is like the “http://” in a URL. “English” tells the reader that the language used in the ‘directions’ is English. Similarly, the “http://” tells your computer what language or ‘protocol’ to use when communicating with a website. Websites generally use http which is the ‘hypertext transfer protocol’. The : simply separates the protocol from the rest of the address and the // indicates that a connection is being attempted. “Cabinet 1” is like the domain name igoldrush.com, a specific location amid millions of other websites. Each step after Cabinet1 tells the reader how to locate the specific page they need. Everything after igoldrush.com tells a computer how to find specific data (or content) to display. Now I understand. thank you so much. great article ! You have explained it in a simple way. The question is TERMINOLOGY, not function. WHICH part is the URL? Which PART is the ip address? Which :PART is the domain name?